Do you need a Flight Delay Claim Letter because you had a delay at your destination airport? 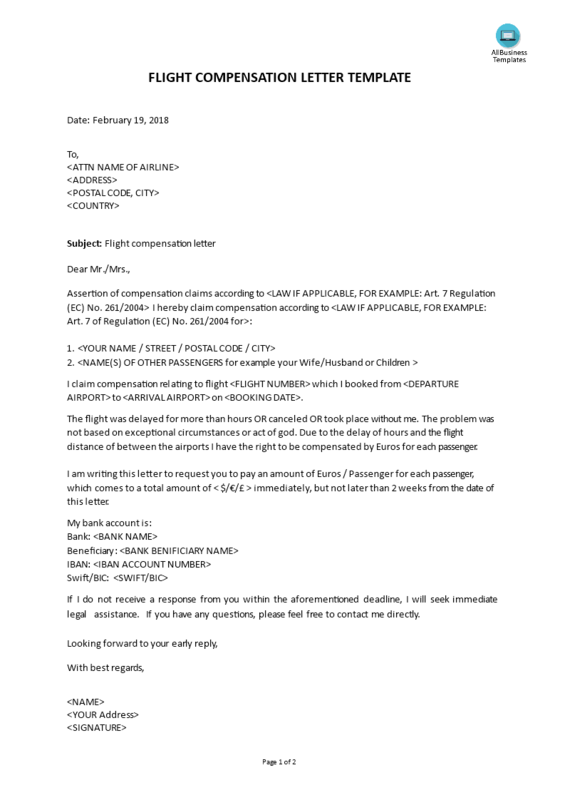 Download this Flight Delay Claim Letter template now! If you were in a situation that your flight was delayed, or canceled or it took place without you, then you might be eligible to claim delayed flight compensation and you can use this Flight Delay Claim Letter will be useful if you want to file a claim at the airline. In order to rapidly manifest your needs, we provide you with the perfect Flight Delay Claim Letter template, which will help you structure your thoughts on every detail in a professional way! How can I get compensation for delayed flight according to local regulations? There are different ways you can claim compensation for a delayed flight. For example in Europe, they have an assertion of compensation for claims according to Art. 7 Regulation (EC) No. 261/2004. This template is customized to claim according to compensation regulations according to Art. 7 of Regulation (EC) No. 261/2004. However, you can always use this letter, no matter where you file your claim. Using this Flight Delay Claim Letter document template guarantees you will save time, cost and will help you to reach your next level of success in your work, education, or business. Download this professional Flight Delay Claim Letter template now!